(1) http://en.wikipedia.org/wiki/Newmarket_Hill,_Sussex. (2) Cooper, Charles (2006) A village in Sussex: the history of Kingston-near-Lewes. (3) Taylor, Roger (1990) A History of Kingston-near-Lewes. (4) Thorburn, M. (2001) An Account of the Manor of Hyde: Kingston near Lewes, Sussex. (5) Mrs Alexander (1950’s) edited and reprinted by H. & A. Craven, Record Book of Kingston. 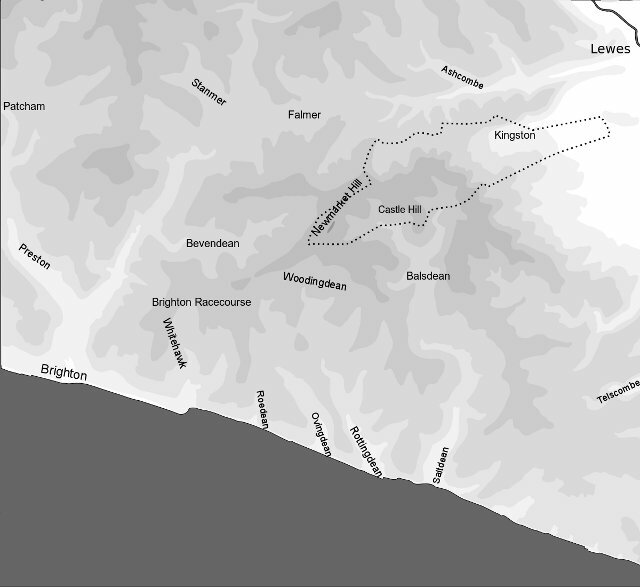 (6) Lost Villages of East Sussex. (7) The Hunns Mere Pit, The Hunns Mere Way.